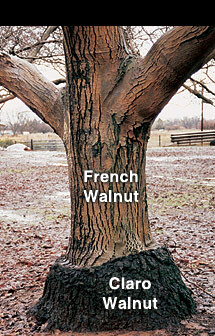 Because the trunk and root system of Claro is better adapted to local soil and climate conditions and is less susceptible to disease and insect attacks, it is widely used by the commercial nut plantations as root stalk material on which the desired French/English strains are grafted for nut production. Due to this grafting technique, after many decades of growth, we can actually produce blanks of these two completely different woods–Claro and French–from the same tree. What constitutes FIGURE? Our definition of figure is: Any differentiation in the grain pattern or flow which adds some distinguishing characteristics to the beauty of the stock. 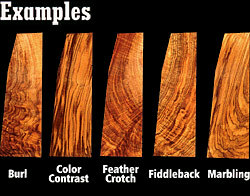 This will include color contrast, fiddleback, feather crotch, marbling or burl, and can be one or any combination of these. What constitutes BEAUTY? Beauty, as defined by Webster's is "A quality or a combination of qualities that delights the senses and appeals to the mind." 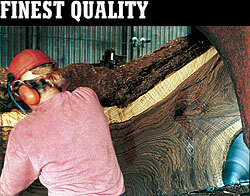 When it comes to grading wood, beauty truly is in the eye of the beholder. 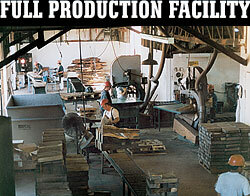 For without question every person has their own preference or concept on what qualities make for a beautiful gunstock. 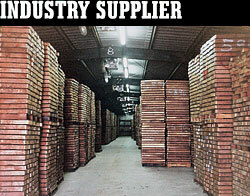 But, having decades of experience we are confident that we can provide that special piece to satisfy most expectations. Whether we are choosing one stock for an individual customer or one thousand stocks for a manufacturer, we will provide the best possible product while always keeping in mind that function and performance must come before beauty.